Mumbai's civil rights organization Ghar Bachao, Ghar Banao Andolan (GBGBA) has said that after receiving a number of false assurances of rehabilitation in a safer residential area, the residents of polluted Mahul (#MumbaisToxicHell) have decided to hold a mass rally from their protest site, which they have ‘occupied’ in Vidya Vihar, to Mantrayala on December 15, 2018. Evicted from their 40 plus year old slums near the Tansa pipeline and allegedly dumped to die in Mumbai’s "most polluted area", GBGBA warns that if the Maharashtra government under chief minister Devendra Fadnavis fails to act as per Bombay High Court’s order and rehabilitate them, the rally would surely be held. 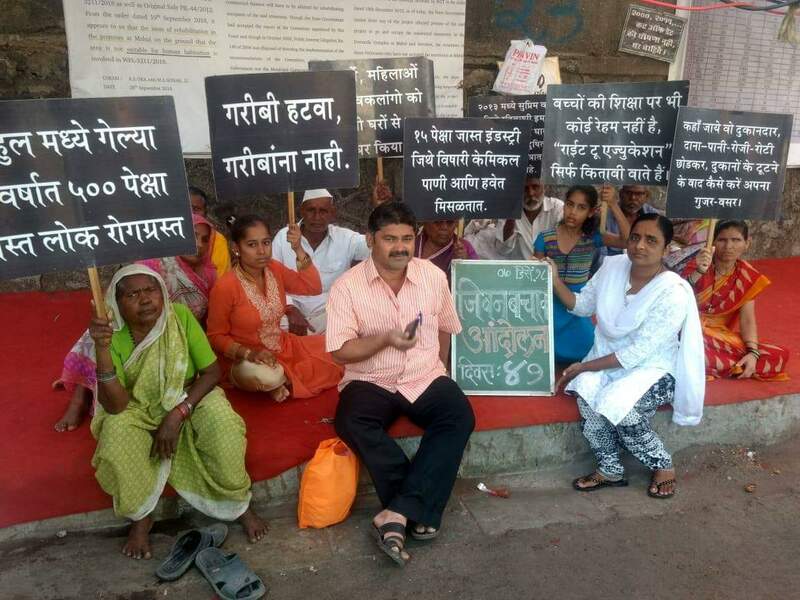 The Maharashtra government has chosen to maintain silence on the issue, which involves the lives and health of 30,000 of the poor citizens of the city, who have been evicted from their 40+ year old slums near the Tansa pipeline and dumped to die in Mumbai’s most polluted area -- about which the National Green Tribunal (NGT) observed that there is a serious threat to the health of residents rehabilitated in Mahul. The Tansa pipeline rehabilitation-affected people, who were forcefully shifted to Mahul and whose homes and whose were demolished, have been demanding relocation to safe housing, as their current location is affected by industrial, air and water pollution, which have been causing several deaths and chronic health issues. The Bombay High Court on August 8 had directed the state government to provide alternative accommodation to the residents of Mahul. The Fadnavis Government’s failure to act on the Court’s order forced the residents of Mahul to stage a dharna, which began on October 28. There are alternative housing available in Mumbai. As per information collected through RTIs, there are more than 1,00,000 houses generated for project affected persons (PAPs). These have been constructed by different housing agencies like Maharashtra Housing and Area Development Authority , Mumbai Metropolitan Region Development Authority, and Slum Rehabilitation Authority. A total of 5,500 tenements are required to accommodate all the residents of Mahul. On November 12, 2018, in a meeting with Mahul residents, housing minister Prakash Mehta had assured the Mahul residents that his government could accommodate 5,500 families in Kurla HDIL-- a rehabilitation site. These 18,000 houses were built for airport expansion project affected families (PAFs) but only 12,000 PAFs were affected by the airport expansion, making houses 5,500 available for PAFs from Mahul. This was admitted by Naseem Khan, MLA, and endorsed by housing minister Prakash Mehta as well. 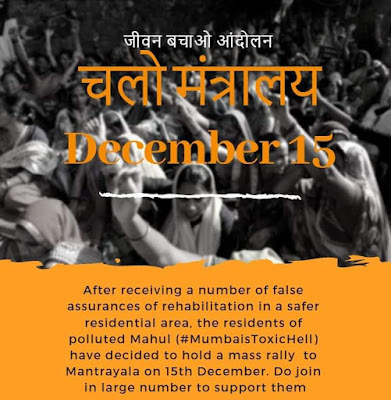 At the meeting at Mantrayala on November 12, Mehta stated that Fadnavis too had noted that the pipeline affected would be rehabilitated in situ, and announced it to the media. But what emerged out of another meeting between Shiv Sena youth leader Aditya Thackeray and Fadnavis on the issue of Mahul on November 27, was another story. Fadnavis claimed that he did not agree with what his own housing minister was proposing as a solution. In this meeting the chief minister refused the proposal to provide alternative housing in Kurla HDIL to all 5,500 families, and also chose to stay silent on options available at places other than Kurla. The government is treating the poor residents of Mahul like garbage, which is completely in contrast to their claim of ‘sabka saath sabka vikas’. Meanwhile, Mahul resident Dharmendra Rathod, who was suffering from TB, passed away on Saturday. This is seventh demise during the protest which began on October 28. The abnormally high level of pollution in Mahul has been causing deaths and serious diseases like TB, asthma, cancer, heart attack, paralysis etc. while the constant risk of major accidents from the nearby industrial instill perpetual fear. As recently as August 8 a major blast in the nearby refinery shook the entire residential area. These building lacks even basic emergency exits. In the inception interim report prepared by a team of Indian Institute of Technology-Bombay, constituted on the direction of Bombay High Court, it is clearly stated that lives are at risk in the absence of emergency exits in such a potentially dangerous area. The report also points out other potential risks to life apart from pollution, the main complaint of the residents. The roads here are also too narrow for emergency evacuation. NGT, while noting serious health risks in its order in December 2015, directed the Maharashtra Pollution Control Board (MPCB), to set aside a buffer zone between Industrial and Residential areas in four months’ time, so as to avoid the impact of industrial accidents on the human population and also imposed on them a fine of Rs 1 crore. MPCB has not complied with the direction so far, and the Government of Maharashtra chose to dump a human population in a death trap. The people of Mahul were originally evicted from their slums and forcefully sent there by the state government. To demand justice and immediate relocation, they will be holding a massive rally December 15 if the government fails to act and resolve the issue.